LinkedIn - A B2B Marketers Dream? LinkedIn – A B2B Marketers Dream? So I first wrote this article a number of months ago for Smart Insights but I wanted to share it here as many of you are unlikely to happen across it there. I hope you enjoy and get something useful from it. Having trained hundreds of people over the years on how to get the most from LinkedIn, today I’ve shared some quick tips which you should find immediately actionable. Just a recruitment site? I don’t think so. LinkedIn has had some bad press over the last few years. Too many recruiters, too many people spamming it with innocuous posts and too many people treating it like a more personal social network, which it simply isn’t. My experience of the platform has been far from that reality. I’ve had nothing but success from leveraging this corporate stage but I believe that has far more to do with my mind-set towards it and how I use it for the B2B business environment I operate in. Over the last 5 years, I’ve been delivering LinkedIn training courses to everyone from students wanting to improve their employability, to sales people looking to build leads to CEO’s looking to position themselves on. In this article I’ll share some of the reasons I believe LinkedIn is worth your time and investment as well as a few quick tips for supercharging your usage. So why is social networking in the B2B world even a thing? Let’s start with a few fundamentals and reasons why I believe this platform stands head and shoulders above the rest in the B2B world. 1). It’s not what you know. You’ve heard the saying a thousand times. LinkedIn is the social network that makes this come true, but only if you’re prepared to put the time in to build connections and work those connections to increase your business. 2). People are there to do business. The main reason people are on LinkedIn is because of business (ok there is the job hunting element as well but let’s put that aside for a moment). It’s your boardroom of connections not the coffee shop connections of Twitter, Facebook or Instagram. And if that is true then it’s the place you need to be for business. The challenge is, you can’t just expect to sign up a profile and for business to flood in. 3). Thought Leadership is the modern marketing. It’s all well and good saying you can help people. It’s all well and good saying you’re the best in the business, but can you prove it? Social commentary and thought leadership pieces prove you know what you’re talking about. LinkedIn provides one of the best platforms to showcase this. 4). People WILL be Googling you. Google has billions of searches a month conducted on it. LinkedIn is well respected and will show up in results for keywords, particularly your name. The next time someone is thinking of doing business with you they will probably google you. If you’ve got a cracking LinkedIn profile they will find it and you’ll stand more chance of securing their business. Conversely, if your profile is out there but unloved its not going to paint you in the best light. 5). There are no gatekeepers. I remember when I started my business (1999). The first challenge to getting to decision makers was getting past the gatekeeper. There were even strategies for this and rebuttals you practiced. It was a dark world where rejection ruled supreme. LinkedIn cuts all that out. It puts you in direct contact with the people you want to be connected to. The question is though, are you making the most from it? Are you adopting strategies that help open doors, create conversations or are you trying to sell to people straight away and cold. Oh god please don’t tell me you are one of those. Five tips for supercharging your LinkedIn usage. Tip 1) Ensuring you have the edge over your competitors – Think of your profile like a beauty parade, your potential prospects putting it up on screen alongside your biggest competitors. Does it set you apart, does it give you the edge? 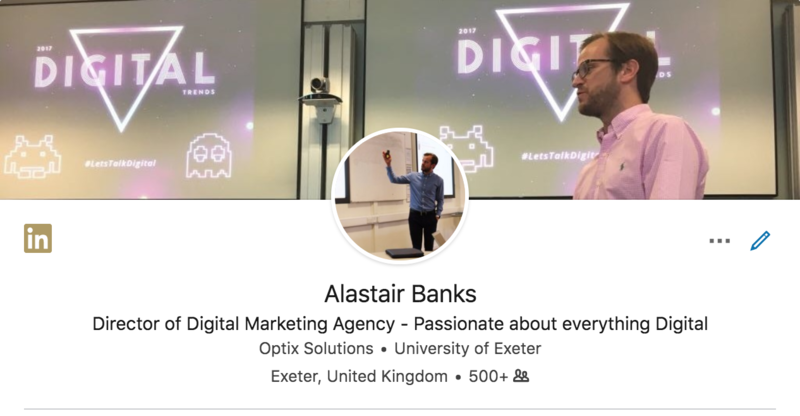 Ensure you cover off the basics, like having a quality photo and using the line below your name to say something a bit more about you than simply your job title. Unlike the rest of the population don’t use the summary section as a CV, think like the person reading your profile – what value can you bring them? How have you helped others? Use Rich media to help you stand out – you can upload PDF’s, Video and Slide Decks to position yourself as a real expert in your field. Tip 2). Start building your connections – LinkedIn is going to be of more use if your numbers are larger. I don’t say that for vanity reasons, I say it because it’s true. Larger connection numbers mean greater reach for your content and a higher likelihood you’ll be able to ask for introductions from the mutual contacts you share with people. I’m not advocating adding your mother just to get your numbers up (unless perhaps she’s important to your business dealings in which case I hope you’re connected already!) I just mean that you need to get into a routine of adding people you meet at events, networking opportunities and even sales meetings. Quick pause for a thought. How many of your current client base are you connected with? First place you should probably start getting connected before your competitors do. Tip 3). Speak up – got something valuable to say? Say it. Use the update section on the homepage to keep people up-to-date with your relevant business news and when you’re ready to step up, start using the articles section to publish longer form content. You’ll almost certainly find, as I have, that you get a decent amount of engagement from the business community if you take the time to create educational, interesting and valuable content which helps others. This is true thought leadership we’re talking about here. Tip 4). Say hello – It’s called social for a reason but I think we forget that sometimes. The number of people I know who have a LinkedIn account but never check or login baffles me. If someone takes the time to send you an invitation to connect then perhaps it’s worth you reaching out. I’m not suggesting you have to do this with everyone but a simple conversation starter has been the impetus for creating business opportunities for me time and time again. Tip 5). Running a group – Groups are great but there are so many and it’s hard to keep track of them. My best advice, if you can make it work for you, is to consider creating your own group. Perhaps you could look to create a space where your prospects gather and debate their industry? Maybe it’s a space for clients or strategic business partners. The best thing about being head honcho on a group is that you get to see who’s joining (and if they might be a good contact for you) but even better you can email them all once a week. What power. If your group has big numbers then this could be a real winner. Good luck on your journey and I wish you every success in making LinkedIn work for you more effectively. If you’re interested in learning more about this powerful platform then check out my Udemy course: Effective use of LinkedIn: https://www.udemy.com/linkedin2017/ – I’ve now had over 15,000 people from all over the globe take my courses and still scoring 4.5 out of 5 stars – very chuffed with that.